Sunday, I invited several women with Parkinson’s Disease to a meeting at my home in order to form a support system for women with PD in Los Angeles. One woman cancelled the day before; she said she was still in denial and was afraid to be around other women with PD. This is not surprising. One of the hardest things for everyone when hearing the words “You have Parkinson’s Disease” is acceptance. Those four words conjure up a bleak future, perhaps of an elderly person with a noticeable tremor, stooped posture and shuffling walk. Or worse, someone sitting and drooling in a wheelchair. No one wants that future. And the younger you are, I imagine the harder it is to accept it. Denial takes many forms. We resent that our lives cannot go back to “normal” (whatever that was before the PD symptoms started). We resent that there will forever be a “new normal” for us; and that it can get worse with time. We find it hard to talk about, even with our family and close friends, because that constitutes an “admission” that we will forever be different. For those of us with tremor dominant PD, it means hiding the uncooperative hand in a pocket, sitting on our hands or finding some other way to hide the tremor from your unsuspecting friends (Michael J. Fox speaks about having to lean on props on the set to hide his symptoms). But at some point, it becomes impossible to hide. I remember speaking in front of a group without a podium, a script in my non-PD hand, desperately trying not to shake. It was awful. It was humiliating. It got to the point that even when standing behind a podium, I was sure everyone could see me shaking. Still, I could not — I refused to — come to terms with having PD, no matter how visible my symptoms were. 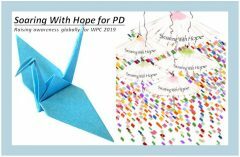 Finally, after struggling for about 5 years, including at least 2 years in therapy, I was able to acknowledge it and start writing about having PD. Even then I still wasn’t ready to share it with the world. I started writing for myself, and then for others with PD. Perhaps this was still partial denial; I would only share with a select group of fellow sufferers. There was no way I was going to post anything on my Facebook Page, and I certainly wasn’t going to volunteer the information unless asked. So I started this blog, and then a Facebook page just for Twitchy Woman. And then, in a Parkinson’s moment, I made an accidental posting on my regular Facebook page a month or two ago. I realized it a few minutes later when friends started to like my post. At first I was horrified. I immediately removed the post and put in on the Twitchy Woman page, but you can’t put the proverbial genie back in the proverbial bottle. Since then, the “mistake” has been liberating to some extent. While I am not ready to shout it from the rooftops or put a “PD” neon sign on my head, I no longer feel the need to go to great lengths to hide what I have. I don’t know if I am 100% out of denial (or if I ever will be) but I am definitely more at peace with this disease than I was. I am grateful that my symptoms have progressed slowly and that Sinimet comes close to eliminating my tremor, and it certainly helps to stay abreast of the latest news coming out about new drugs that may slow or even reverse the progress of PD. I think I have entered a stage where I no longer fear that PD defines me; I have accepted that it is a part of me and that I have to deal with it and manage it. By embracing it, I have been able to move forward. And that is liberating. How have you gotten past the denial stage? We all cope differently, so please share your thoughts by sending them to me at Twitchywoman18@gmail.com. I will post a compilation of your responses in a few days. Hope all is well. You¹ve been quite busy, which is great. My dear nephew David (Talby¹s oldest son) sent this article with cutting-age developments that I wanted to share. Very encouraging! Much like me with this disease.